Vertical pipe carrying cold water to a house’s upper floors. Vertical pipe carrying hot water to a house’s upper floors. Pipe carrying waste from a toilet to the branch. Pipe draining wastewater from the fixtures to the waste stack. Device for mixing hot and cold water for the bath or shower. Hole at the end of a pipe carrying overflow water to the main drain. Device for gauging the amount of water consumed by a household. Valve for shutting off the water supply to the entire house. Pipe delivering cold drinking water to a house’s plumbing system; it is an extension of the water service pipe. Metal part screwed to the drain that can be removed if the drain needs to be unplugged. Pipe through which wastewater is discharged and carried to the building sewer. Pipe that uses gravity to carry wastewater from a fixture to a branch. Fixture consisting of two basins having a water supply and equipped with a drain; it is used in a kitchen or a laundry room. Allows air to circulate and maintains constant pressure throughout the entire draining circuit. Vertical pipe vented directly outdoors that allows air to circulate throughout the draining circuit; it also vents sewer gas. Point of entry for outside air into the main circuit vent. 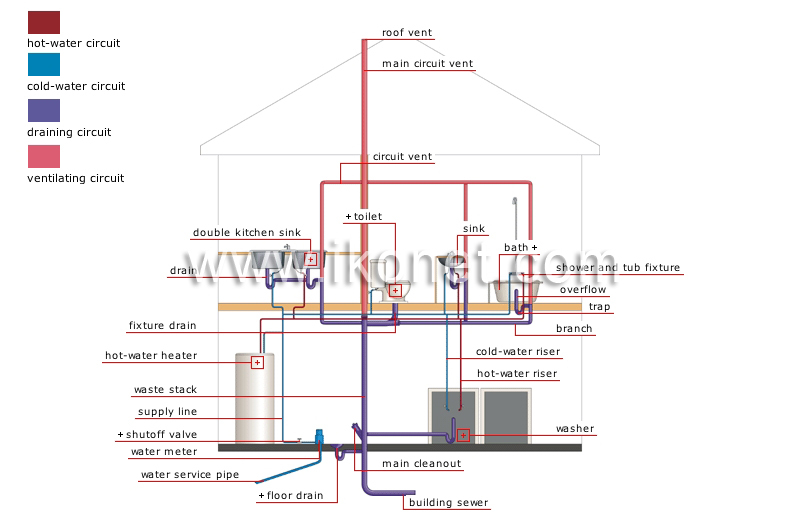 Set of interconnected pipes distributing hot water from a hot-water heater. Set of interconnected pipes distributing cold drinking water throughout a house. Set of interconnected pipes allowing wastewater to drain into the building sewer. Set of interconnected pipes allowing air to circulate in the circuit.